These verses of the Qur’an state that plants are created in pairs and indicate a great truth which was discovered only in the twentieth century. It is as follows: The root of the words “azwaj” and “zawjayni” used in the verses is the word “zawj”. While the word of “azwaj” is the plural form of “zawj”; the word of “zawjayni” is the dual form of “zawj”. And the word “Zawj” means “spouse”. 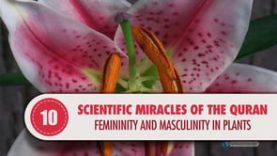 As a result of the studies made on plants, it is understood that there is masculinity and femininity in plants too; and with the help of these different organs, reproduction occurs in plants. There are male and female reproduction cells in flowering and seedy plants. These cells are produced by the male and female organs both of which are in the middle of the flower. In the tumid part of the female organ called ovary, there are small and round seed ovules, and within them there are female reproduction cells, too. The male reproduction cells are hidden inside the pollens produced by the anther of the male organ. While pollens, which are very light, are carried from one flower to another through winds or various animals, some of them cling on the vertex of the female organ. Afterwards, this pollen grain moves downwards from the stylus and reaches the ovules of the ovaries through a tube. The male reproduction cell passes from this tube and unites with the female reproduction cell in the ovule. When male and female reproduction cells unite, ovules are formed and then seeds are formed from them. Now let us think of the following point: Biology was not a developed branch of science during the era of the Prophet Muhammad (PBUH). The reproduction of plants and the role of the female and male elements in this field were not known. With the development of the science of biology and botany, the existence of male and female cells in seedy and flowering plants was understood. Botanists were able to discover the difference of gender in plants only 100 years ago. Then, how did a person who did not know how to read and write manage to know that there was masculinity and femininity in plants at a time when people were not aware of botany and biology? This question can only have one answer. It is as follows: That person did not know it on his own; He knew it because Allah, who creates pairs from plants, informed it about him. If this answer is not accepted, we will never be able to explain that person’s informing about scientific facts and his news turning out to be true. No one’s mind can accept that a person who did not know how to read and write was able to discover a fact 1400 years ago on his own and write it in a book though that fact was discovered only 100 years ago by people who spent all of their lives by studying biology and botany. A person who accepts this cannot be considered sane. There is only one answer that human mind can accept: The Qur’an is the book of Allah.